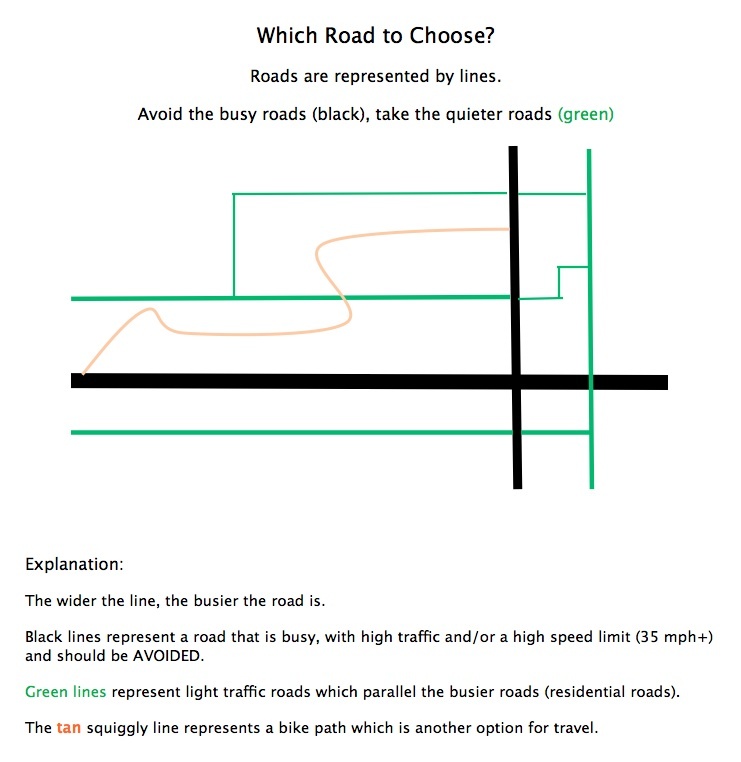 DrivenToBike.com – Page 2 – For those driven to bike commute. The Active Transportation Alliance’s Bike Commuter Challenge ended last Friday, and I wanted to share some of my thoughts. Overall it was a very positive experience, and I had a lot of fun being captain and inspiring people to at least think about bike commuting. I’m very proud of my team for putting in such a tremendous effort. I found out about this through a brochure I had received for Bike The Drive, another event in which I had a lot of fun. Since I already enjoy bike commuting and do it as much as possible, I figured this would be the perfect opportunity to let my coworkers know about a fun challenge to bike commute. Registration was free, but I donated a bit to Active Transportation to show my support. I sent out an email the Friday before the start of the event to interest people in the challenge. It was well received, with people talking about wanting to join, or asking me how I go about commuting on a bike. Ultimately, our team consisted of five people, all of whom gave their best effort. One person had good intentions but could not ride due to family obligations, but the rest of us really cranked out the miles. We endured carrying our lunches, change of clothing, heavy U-locks and rode through bad weather (rain, humidity, tornado warnings, heat) to make it through the 6 days. We ate “healthier”, needed more sleep and paced ourselves for the duration of the challenge. As a team, we found the strength to make it through by asking each other about our rides, talking about our strategies and anticipating weather patterns. We rode as much as possible, but set realistic goals for ourselves. If the demands of work or family were too much, then it was OK not to ride in. If the weather looked uninviting, then it was better to be safe than sorry. As captain, I felt I had to be mentally strong and ride everyday to set an example to others that it was possible, even on bad weather days when I normally would not commute. I also sent out some emails offering encouragement with some tips. My coworkers and I were really lucky the worst of the weather seemed to hit while we were all still at work. I only got drizzled on twice. What also excited me was that one of the ladies on the team used this challenge as motivation to finally try commuting to work. She had thought about it and finally decided to make the plunge. Thinking back to when I first tried bike commuting, I would’ve loved to have been part of a group. As of this writing, we had 14.5 trips, for a total of 384.6 miles and a 2.7% participation rate. The trip log will not be closed until June 30th, so we’ll have to see when the numbers are locked down. At a total of 384.6 miles, this came out to be 384.6 miles/5= 76.92 miles/rider, which looking at the stats, is the highest among any company in Chicagoland. This ranks us 23rd out of 86 companies in the “For Profit 100-499 Employees” category. This is truly impressive for such a small team, and reflects the tremendous individual effort of each rider. Individually, I am 14th out of 6000+ riders overall in terms of miles. I also believe that I am the top ranked female in terms of distance (188.4 miles). These are all verified miles using the Strava Mobile app on June 13th, and June 16-20th. I rode everyday of the challenge but was unable to bike as much as I wanted to on Thursday, June 19th. The Metra did not allow me and two other bicyclists to board the train as there were already too many bikes exceeding their capacity. It was disappointing since I had intended on biking at least 30 miles a day. That meant taking the train in the morning and then biking to work, and then biking the entire 20 miles back home. I learned this week from a conductor that Metra had been swapping out their cars for some reason and they had given the train I take two cars which didn’t allow bikes. It just doesn’t make sense why Metra decided to do this during Bike to Work week. I could’ve waited for another train, but that required waiting another hour for the next one and I didn’t want to risk having the same situation. I could’ve biked all the way to work, but had not mentally prepared myself for the distance, and also felt uneasy about biking in the drizzling weather. Defeated, I decided to turn back home and drive (boo!) to work. Friday I made up for it by biking 57 miles and finished strong. As I was nearing the end of my final ride for the week, I was having so much fun and going very fast that I wasn’t really paying attention and hit a speed bump so hard that it caused a flat in my front tire. Luckily, it was the last block before home. Overall, this event was very satisfying and highlights the fact that many people are willing to give bike commuting a try. If you see how many people signed up and entered their stats on the website, it is very encouraging. I am a true believer that participation in events such as this make people realize that bike commuting is a viable means of transportation. With time, people’s perception of biking will change for the better. Think of your cubicle as a rest stop between your bike commutes. It’s where you can recuperate and prepare for the ride home. My cubicle is not the most spacious in the company, but it is big enough. I’d say it is 5’x8’, which was nearly the size of my dorm room back in college. Between my piles of paper and a computer and phone, there is still plenty of room to store stuff in file cabinets and drawers above and below my desk. I devote half of my storage space for bike commuting items and the other half to work-related items. If you are lucky, you may even store your bike in your cube until HR tells you not to. I don’t because it is a hassle for me to wheel it through the cube farm and through the security doors. When I’m not in lab doing experiments, I eat and hydrate as much as possible while I’m doing paperwork in the cube. It’s important to take care of yourself throughout the workday to maintain your energy. You need to be focused when you leave, so take every opportunity you can to sneak in a snack and drink liquids. I have one drawer dedicated to all of the snacks that I have. This includes tea, crackers, fruit snacks, Gatorade, an emergency can of sardines, and whey powder that I drink in the morning. I also have some spare change in case I need a sugar boost from the vending machine. I keep a mug and a drinking glass at work. 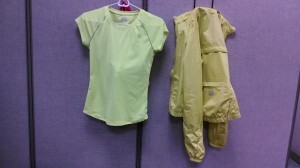 I bring a change of clothes everyday, but you could certainly stash them at the start of the workweek if you wanted to. Bringing shoes to and from work is very exhausting due to their weight and space that they take up, so I have a drawer dedicated to work shoes. I also keep a hairdryer, shampoo, baby wipes and cosmetics to help me look presentable. You may also benefit from simple first-aid items such as band-aids and antiseptic spray, in case of a fall or accidental cut. I have a spare bike pump and patch kit in a large drawer in case my bike tire goes flat. I also have a bottle of chain lube in case I’ve biked through rain in the morning and have time to lubricate my chain during the lunch hour. The only things I don’t keep in my drawers are my bag, helmet and clothes that I commute in. I hang up my clothes to let them air out during the workday. 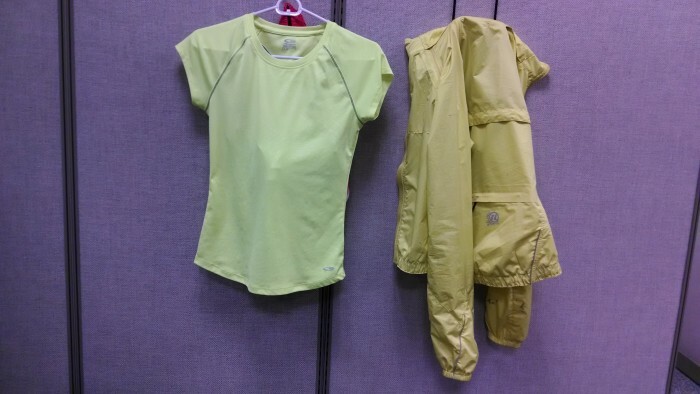 Bright clothes to blind my co-workers. There’s a reason why Chicago’s Bike to Work Day isn’t held in May, but in June. 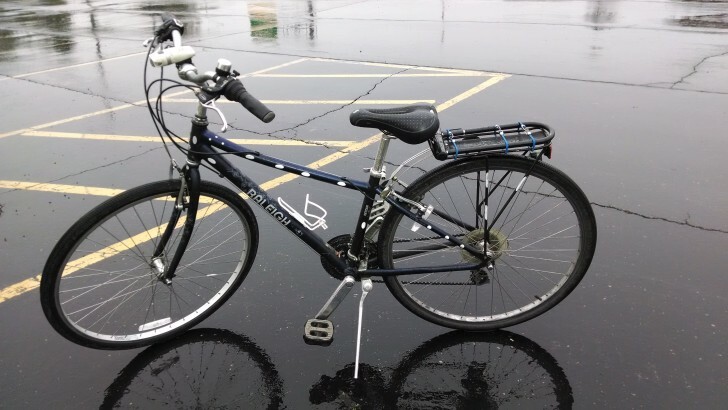 I really wanted to bicycle the whole 20 miles to work on Friday, but the weather looked too gloomy and the Doppler radar on the morning news confirmed the least favorite weather condition I like to bike in: rain. So I took the train out of the city to minimize my time dealing with wet roads. I really hate riding in the rain. I could get fenders, but why add more weight to my bike? It’s OK if the weather is warmer and I get soaked into work. I just deal with being completely wet and do a full clothing change and wash my hair in the sink. By the time I’m ready to go home, all of my clothes hanging in my cubicle are dry. But COLD rain? At 38 degrees? Not fun. When I got off the train it started to drizzle. No problem, so I doubled gloved, turned on all of my lights and went on my way. 20 minutes into my commute, it started raining, and then that’s when I knew I needed to pedal faster to increase my body heat. As an added bonus, I had to bike an extra 2 miles using an alternate route since the sidewalk path I use was blocked off due to railroad construction. Luckily the wind was light and there was little traffic on the roads. When I was a few miles away from work, it started snowing and I literally started screaming. After the horrible Chicago winter we had, I just couldn’t take it anymore. I was even more motivated to pedal faster and push my way through the cold. It was miserable. The sky was dark, and I could feel the weight of the wetness dragging me down. When I finally arrived at work, it was more a sense of relief. What a way to start the day and be fully awake! After I had warmed up and changed out of my wet clothes, I felt a great sense of accomplishment that I was able to handle the 10 miles in the cold rain and bit of snow. Each time I push myself further, I see what is possible and how to optimize for a similar trip in the future. 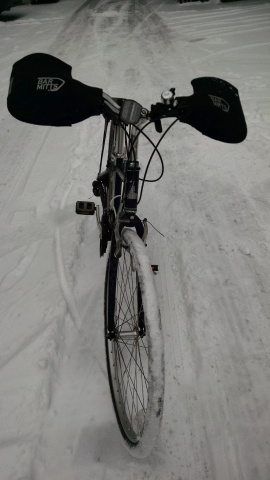 After hearing from my co-workers about how bad traffic was (since people were staring at the snow bewildered and driving slowly), I was glad that I didn’t drive and participated in Bike to Work day. Bike arrives before cars early in the morning.